It is true that palaces and gardens are two different types of construction, and distinct examples of both types have remained. However, since palaces are usually accompanied by gardens, there are also many examples that are simultaneously a palace and a garden. If we take no notice of the original foundations of some of the introduced works presented here—which may, according to research, date to the sixth, eighth, or ninth century—are from the eleventh through to the fourteenth century. The earlier examples have changed through centuries to match a figure according to the tastes of the time. Among works introduced in these two volumes, there are the most significant extant examples of the Safavid era in Esfahan and of the Zand period in Shiraz. Most of the works of the thirteenth and fourteenth centuries are in Tehran, however, and show the transformation of architectural space and spatial design of buildings and gardens in the confrontation between the old traditions of design with the modern and innovative taste of the time. Particularly, comparing examples from the fourteenth century with earlier examples from the thirteenth century speaks of a dominant shift from the old traditions to the new paradigm. The Golestan Palace ensemble, comprising the bulk of volume 19, is among the most remarkable and credible evidences to the mentioned point. Its original foundations are usually traced back to the Safavid period; nevertheless, it was developed to become the seat of government during the Qajars. The Golestan Palace ensemble comprises many different sections and buildings. Throughout the thirteenth century to the mid-fourteenth century, and even later, it has undergone many transformations, namely destruction or addition of some buildings, or the modification of existing ones. In order to better trace these changes, each building in this ensemble is introduced separately. 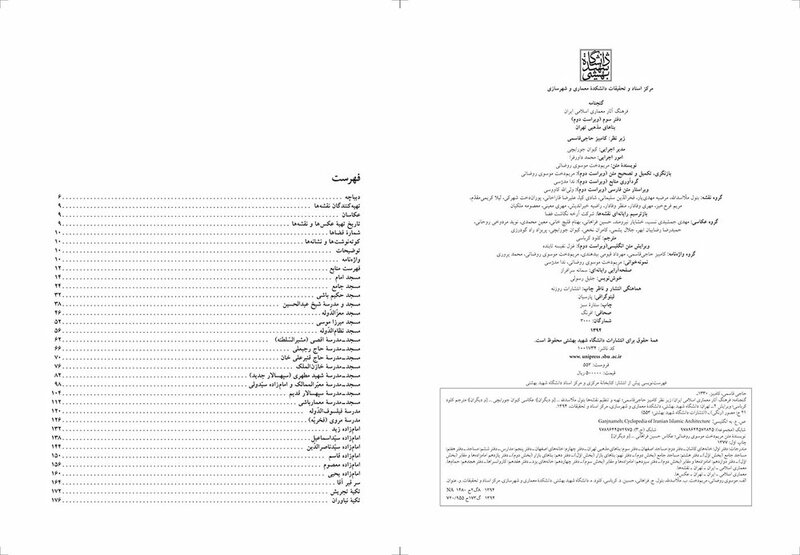 Contrary to the standard form of the Ganjnameh series, a separate section is also included on the development history of the whole ensemble that also covers the destroyed buildings. This was aimed at providing a broad and more comprehensive history. I hereby thank the efforts of experts at the Cultural Heritage Organization and the Golestan Palace Ensemble for providing us access to preserved pictures and documents of this ensemble. Gardens and the making of them are deeply rooted in Iranian history, and are globally renowned. The domain of the Persian Garden exceeds the political limits of past and present Iran, rather reaching a larger cultural domain pervading all the way westward to Spain, and eastward to the heart of India. However, what is presented in the current two volumes includes only a small part of what is left inside the political borders of present-day Iran, and only dating to the later centuries as mentioned above. Unfortunately, of the many gardens from the pre-Safavid era—namely Ghaznavid Gardens in Ghazni and Timurid Gardens in Samarqand (dating from the eighth century or earlier), which he built on the memory of Shiraz Gardens, and also Gardens built by the descendants of Timur in Herat, and those built by Turkmen in Tabriz (during the ninth century), only names or memories have remained. The Persian Garden is like any other garden in that it is a composition of buildings, water and verdure in a vast area of land. The difference is in its special form, which is treated, organized, and regularly laid out, creating planned and devised sights and imagery. The garden is enclosed in a defined shape, and laid out on a flat or stepped piece of land. The internal divisions are also regularly defined with respect to the main axes. Irregular shapes or fractions of them, or curved and slanted lines do not appear in the layout of a garden. The placement of buildings is predefined and responds to hierarchy. The main building, which is often small is size, rests at the center of the garden. Auxiliary and service buildings are often placed at the side walls so as to clear the vast range of the garden. The open and closed spaces in the main buildings blend so well as if they were indistinguishable. It is true that any composition of water and greenery can make up a space that is ecstatic and pleasurable. But in the Persian Garden, because of the designs already mentioned, nature is presented in a special form that accounts for all its richness and fame. In fact, what can be recognized from the Persian Garden is that it was not designed for permanent residence, or for its garden products, rather, it was another image which led the mind of the designer. The Persian Garden maker selects all elements of a garden individually, and composes them in a specific scheme with an incomparable precision, awareness, and skill so as to create a natural world apart from the surroundings. Infiniteness is meant to be manifested within the limits of a garden, exposing another facet of nature—as if to delve into the origins and disclose the essence or substance of nature. The Persian Garden maker attempts to reflect a flawless world devoid of all errors and defects of the mundane world, and create a garden as if cutting a gem out of the surrounding nature. He represents a glimpse of heavenly themes on the fringes of earthly life, and provides a pleasurable place for the souls of humans, as if composing a sonnet to the Garden of Paradise. The majority of the photographers of Ganjnameh, Volumes 19 and 20 from 1995 until 2001 were Keivan Jourabchi, Navid Mardoukhi Rowhani and Behnam Qelich-Khani. The rest of the photos of these volumes were shot by Hossein Farahani in 2015. Both of these volumes were published in summer 2016. 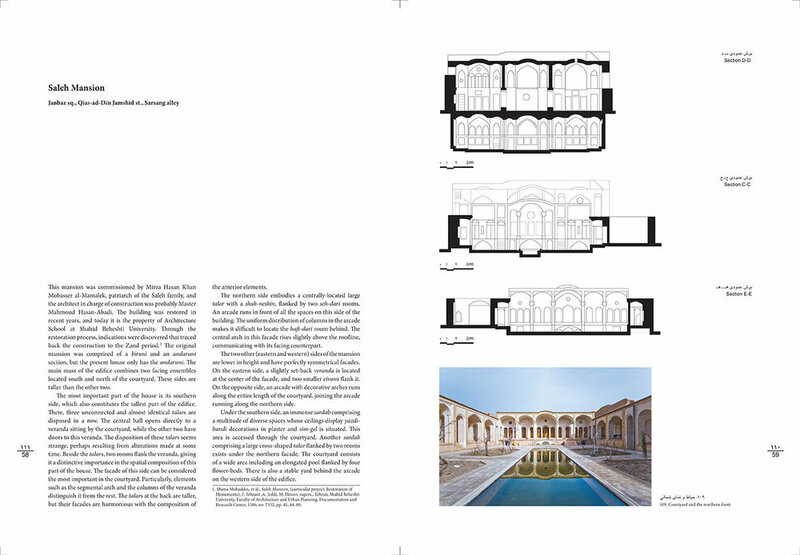 The fourth volume of the Ganjnameh series introduces some mansions of Esfahan. Presented here are but a few among the numerous traditional houses of Esfahan—a city where fortunately, numerous valuable houses have been preserved, although their number is decreasing daily. The buildings introduced, except some Safavid-period houses, belong to the Qajar era. 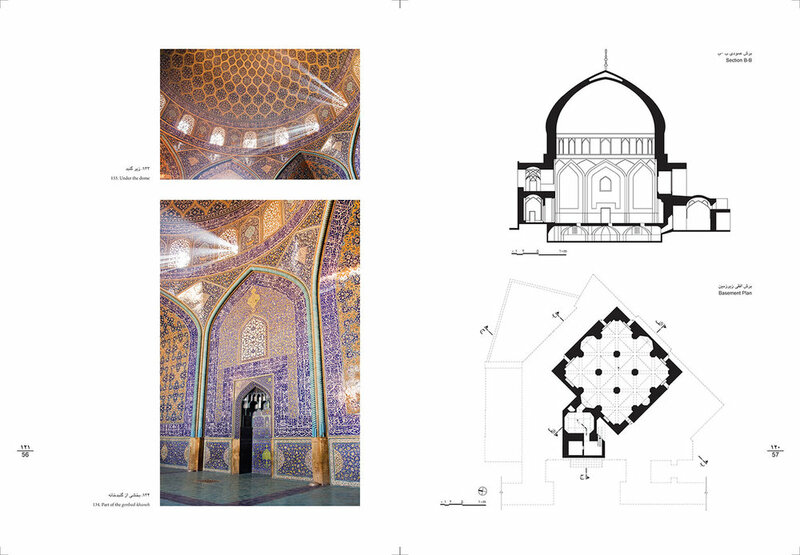 Thus, the evolution of architectural design during the long Qajar period can also be traced in their architecture. Yet, regardless of the differences these buildings have, common principles and themes are discernible in their architecture and spatial organization. دفتر چهارم “گنجنامه” به معرفی خانه های اصفهان پرداخته است. آنچه در این کتاب عرضه شده تعداد اندکی از خانه های سنتی اصفهان است، شهری که خوشبختانه هنوز خانه های ارزشمند بسیاری را در خود حفظ کرده است، هر چند روز به روز از تعداد آنها کاسته می شود. در میان بناهای معرفی شده بجز چند خانه مربوط به دورۀ صفوی، مابقی متعلق به دورۀ قاجارند. به همین جهت تحولات طراحی معماری دوران طولانی قاجار نیز در این خانه ها قابل پیگیری است، اما علیرغم تفاوت های بین این بناها با تأمل بیشتر می توان اصول و مایه های مشترکی را در کیفیت فضاسازی و معماری همۀ آنها تشخیص داد. Most conspicuous in these houses are the large courtyards and lush flowerbeds, around which large and small spaces are disposed. In plan view, these courtyards are crowned by large, ostentatious reception halls which constitute the most important spaces of the ensemble. 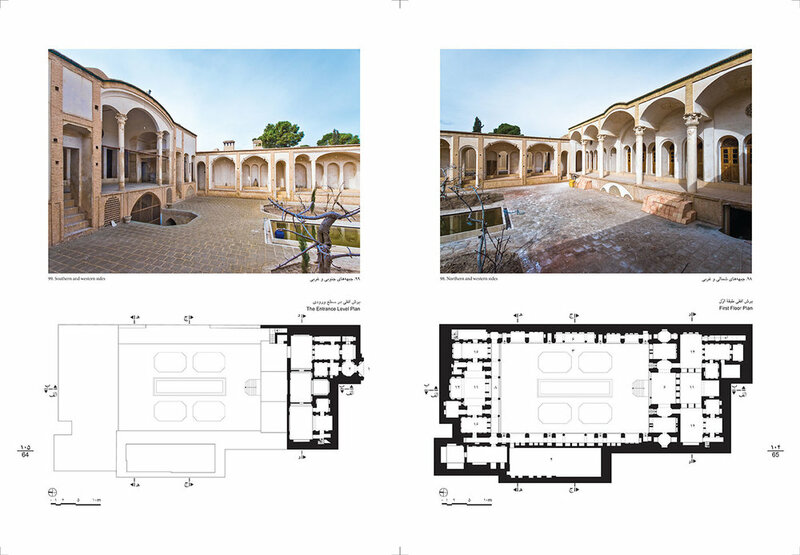 Reception halls (talars) strongly affect the overall spatial composition, form and details of the facades, and the constituent elements of the courtyards. These reception halls overlook the courtyard on the front, and open to adjacent spaces from their sides. 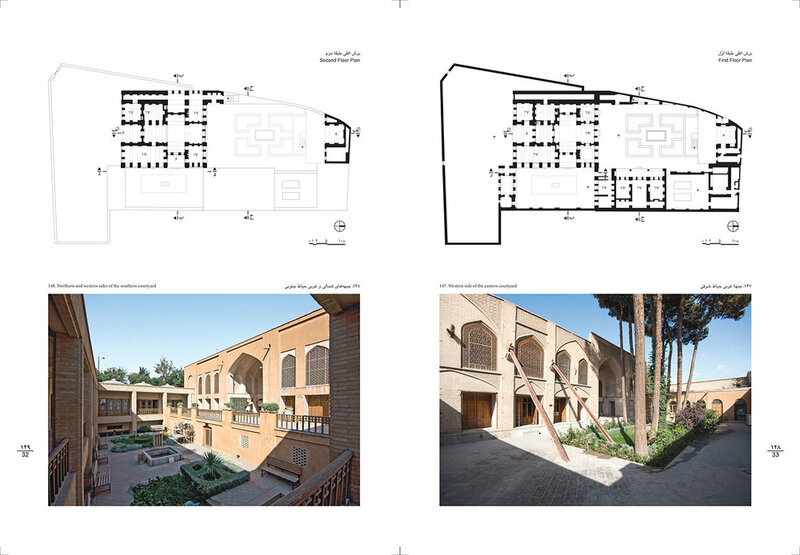 Another important space in most houses is the tall and profusely decorated howz-khaneh, located behind the spaces overlooking the courtyard— removed from the center of the house—and generally, roof-lit. Besides these, mention should be made of identical rooms, different-shaped eivans, elaborate entrances, wide terraces, secondfloor courtyards, penthouses, and antechambers flanking the reception halls. در این خانه ها حیاط های وسیع با حوض های آب و باغچه های سرسبز که همۀ فضاهای خانه از بزرگ و کوچک به دور آنها نشسته اند، بیش از همه چیز جلوه می کنند. همراه حیاط ها، تالارهای بزرگ و پرتکلف که پر اهمیت ترین فضاها محسوب می گردند، دیده می شوند که بر رأس حیاط ها قرار گرفته و به این ترتیب بر ترکیب کلی فضاهای خانه ، شکل و اجزاء نماها و عناصر متشکلۀ حیاط ها تأثیر مهمی گذارده اند. این تالارها از یک سو به حیاط اشراف کامل دارند و از سوی دیگر به فضاهای مجاور خود گشوده می شوند. عنصر مهم دیگری که در بیشتر خانه ها مشاهده می شود حوضخانه های مرتفع و پر تزیین است که در پشت فضاهای مشرف به حیاط و به دور از مرکز خانه واقع شده و نور خود را از سقف تأمین می کنند. در کنار این عناصر باید به اتاق های همانند، ایوان های مختلف الشکل، ورودی های پرکار، مهتابی های وسیع، حیاط های طبقۀ دوم، بالاخانه ها و گوشوارهای تالارها و ... نیز اشاره کرد. The particular quality of these houses must not be assessed in terms of absence or existence of the above-mentioned spaces. Rather, it should be evaluated as the outcome of an order and balance pervading the design and composition of all constituent elements. All the spaces and facades have regular forms and proportionate dimensions and have been designed in full soundness and purity—just like a crystal formation. Their architectural compositions follow a predominantly symmetrical, balanced geometry. While similar, their spaces and arrangements are varied. They all look alike, nevertheless, are different entities. The spaces of the house are placed encircling each other facing the courtyard, as though to turn away from aliens and create a serene, private harbor. اما کیفیت خاص معماری این خانه ها را نباید محصول وجود یا عدم وجود عناصر یاد شده در آنها دانست، بلکه باید آن را ثمرۀ نظم، تعادل و توازنی تلقی کرد که بر طرح و ترکیب همۀ اجزاء خانه حاکم بوده است. همۀ فضاها و نماها اشکالی منظم و اندازه ای متناسب دارند و در کمال صحت و سلامت و خلوص همچون یک بلور طراحی شده اند. در ترکیبات آنها نیز هندسه ای متقارن و متوازن حرف نخست را می زند. فضاها و انتظام بین آنها در عین همسانی، متنوع اند، همه همانند هم اند اما متفاوت باهم. فضاهای خانه به دور هم حلقه زده و رو به یکدیگر به گرد سفرۀ حیاط نشسته اند تا راه بر بیگانه ببندند و خلوتی خالی از اغیار و چهار دیواری در اختیار پدید آورند. Thus, the impression these houses elicit is one of safety and tranquility, of a harmonious and congruous world, and of infinity in finiteness. The agreeable and delightful central courtyard where the heart of the house beats depicts a refined, charming universe. A universe filled with light, water, freshness, sense, and life. Rather than material dwellings, these houses are abodes of the soul, and secure harbors commensurate with it. In this way, everything within them has its own impression. No wall or door, nor pane or window is left unadorned. No space is without moqarnas works, rasmi-bandi trimmings, frescoes, stucco carvings, high and low ledges, tessellated tilework, or orosi windows all combined with color and pattern and in perfect harmony and balance. All are made of earth and mud, stone, wood, and plaster—but not of the kind we know. بدین گونه آنچه در این خانه ها احساس می شود فضایی ایمن و آرامش بخش، جهانی متعادل و هماهنگ و بی نهایتی در محدود است. حیاط های روح نواز و دلگشای نشسته در میانه که قلب خانه در آنها می تپد، عالمی لطیف و پر جذبه را تصویر می کنند. عالمی پر از نور، آب، طراوت، معنا و پر از حیات. این خانه ها، نه خانۀ جسم که کاشانۀ روح و مأمنی به قدر و اندازۀ آنند. به این ترتیب همه چیز در آنها رنگ و بوی دیگر گرفته است. هیچ دیواری و دری و حتی هیچ شیشه و پنجره ای ساده رها نشده و بدون پرداخت نمانده است. همه جا پر است از مقرنس ها و رسمی ها، نقاشی ها و گچبری ها، طاقچه ها و رف ها، گره چینی ها و ارسی ها و همه در آمیخته با رنگ و نقش، و در کمال توازن و تعادل، همه از خاک و گل و خشت، سنگ و چوب و گچ، اما نه آنها که ما می شناسیم. Mansions in Iranian historic cities are representative of the humane, pleasing, and beautiful architecture which was home to our forefathers. It is our responsibility today to take care and conserve these monuments that still brighten up our spirits. This responsibility is not only because we can then find out about the culture and lifestyles of the past, but also because the architecture serves us a way to learn for our future designs. These mansions were built with way simpler materials, more basic technology, and with much less information at hand than today. But how is it that they immediately engage our heart and soul and induce peace and delight? What are the secrets and symbols in the architecture? How did the creators of those buildings think, and what principles did they apply in their designs? What were their thought-out methods and procedures in creating such works and such spaces? The context of these buildings is complimentary to architecture, although it may seem that their design is introvert and does not deal with the exterior. In other words, architecture and its context are both incomplete and meaningless without one another. 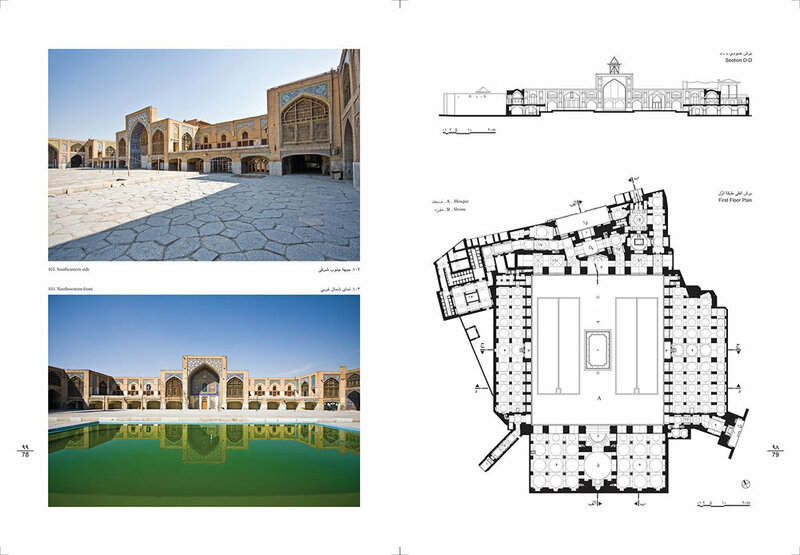 In this regard, a historic monument located inside a fragmented, modified, or even erased town fabric poses as an incomplete, ambiguous architectural work—and this is a fundamental issue facing our historic towns and buildings, among them those of Esfahan. If we ignore this ongoing process, it would be no long that our cities lose their original form and our historic monuments be deprived of their architectural integrity and legibility. This would either impede or even bar further study of our urban and architectural history, burying with it the rich, cultural and artistic backbone in the works which can lead our designs today and in the future. پیداست که هر چند معماری این خانه ها سر به درون دارد و با بیرون از خود گفت وگویی نمی کند، بستری که در آن نشسته مکمل این معماری است. به عبارت دیگر، بنا بدون بستر و بستر بدون بنا ناقص است و به درستی درک نمی شود. بر این اساس، تک بنایی تاریخی در بافتی پاره پاره و زدوده شده یا تغییر شکل یافته، اثری اصم، مبهم، و نیمه تمام است. و این مشکلی اساسی است که امروز به علل گوناگون گریبان بناها و شهرهای تاریخی ما، از جمله بناهای شهر اصفهان، را گرفته است. اگر بر این مشکل چشم ببندیم، در آینده ای نزدیک نه شهرهای کهن ما نشانه ای از صورتی اصیل خواهند داشت و نه تک بناهای بازمانده می توانند سیمای کامل و خوانای معماری خود را نمایش دهند. بدین گونه، راه دشوار مطالعۀ تاریخ شهر و معماری مان ناهموارتر و حتی مسدود خواهد شد و آنچه در این آثار از پشتوانۀ فرهنگی غنی و هنری پرمایه باقی است و می تواند راهبر امروز و آیندۀ ما گردد، برای همیشه از دست خواهد رفت. There are twenty-one mansions introduced in the fourth volume of the Ganjnameh series, representing a handful of myriad traditional houses in Esfahan—we know little about how many have remained. In the sixteen years since the first edition of the volume, most of the houses have suffered from more damage and deterioration, and their surroundings have also been extensively transformed. In this edition, the text has been revised, the drawings reviewed and more accurately redrawn and digitized, and new photographs have been taken of the monuments in order to represent them more comprehensively in a refined, high-quality publication. “Let us see into what acceptance will fall; and, into vision, what will come” [Hāfiz]. بیست و یک بنایی که در مجلد چهارم گنجنامه معرفی شده، مشتی از خروار خانه های سنتی اصفهان بوده که امروز نمی دانیم از آن خروار چه مانده است. بیشتر آنها در شانزده سالی که از ویراست اول این مجلد گذشته، آسیب بیشتری دیده و فرسوده تر شده اند و محیط پیرامونشان هم دگرگونی هایی وسیع یافته است. در این ویراست، متن کتاب بازخوانی و تکمیل، نقشه ها بازنگری و با دقتی بیشتر ترسیم، و از خانه ها مجدداً تصویربرداری شده است. امید که این چاپ کامل تر و با کیفیت بهتر بتواند معرفی جامع تری از این آثار ارزشمند به دست دهد. تا چه قبول افتد و چه در نظر آید. The photography of this volume’s new edition was done by Hossein Farahani with the highest number of photos and the other members of Ganjnameh’s photography team in 2008 and 2009. The photos were taken digitally. Some photos of the previous publication of the book which were slid films were reused for the recent one due to the buildings’ destruction and substandard reconstruction. Nematollah Shojaee, Khashayar Niroumand and Amir Hasan Beigi are the other members of the re-photographing team. Behnam Qelich-Khani, Asad Naghshbandi and Dokhi Afshar, Moe’in Mohammadi and Navid Mardoukhi Rowhani were analogue photographers of the book. عکاسی مجدد این جلد به همت حسین فراهانی با بیشترین تعداد عکس و سایر اعضای تیم عکاسی گنجنامه در سال های 1387 و 1388 و به به صورت عکاسی دیجیتال انجام شد. تعدادی از عکس های کتاب نیز به دلیل تخریب برخی از بنا ها و یا دخل و تصرف غیر اصولی در آنها از نسخه قدیمی کتاب که به صورت اسلاید هستند، انتخاب شده است. نعمت الله شجاعی، خشایار نیرومند و امیر حسن بیگی، دیگر اعضای تیم عکاسی مجدد و همچنین بهنام قلیچ خانی، اسعد نقشبندی و دخی افشار، معین محمدی و نوید مردوخی روحانی، عکاسان آنالوگ کتاب بودند که در تهیه تصاویر کتاب نقش داشته اند. 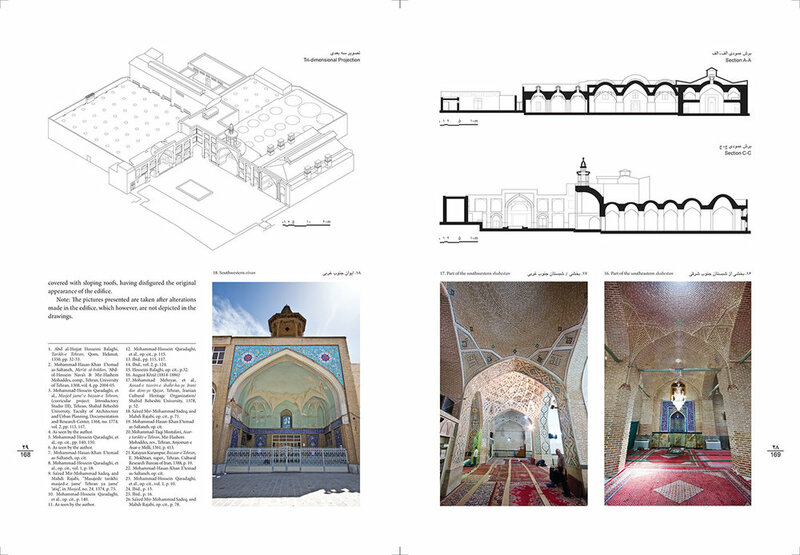 The third volume of the Ganjnameh series introduces religious buildings of Tehran, and is unique among other volumes in that it introduces several types of buildings. This is because the present volume was the first of the series to take shape in view of the 200th anniversary of Tehran’s adoption as capital. 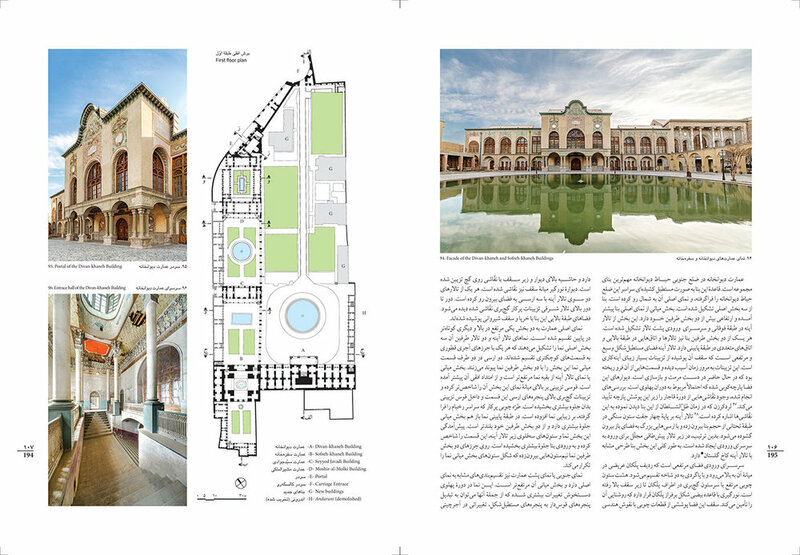 However, when the layout of the rest of the series was finalized, owing to the particular status of historic buildings of Tehran and the benefits the publication of this book was judged to bear, it was decided not to upset the present composition. جلد سوم گنجنامه به معرفی بناهای مذهبی تهران می پردازد و به جهت این که انواع بناها را در خود جمع آورده است در میان مجلّدات دیگر گنجنامه یک استثناء است. علت آن است که این مجلّد اوّلین دفتر گنجنامه بود که شکل گرفت و به مناسبت دویستمین سالگرد پایتختی تهران به این موضوع اختصاص یافت. بعدها که گنجنامه ترکیب نهایی خود را یافت به دلیل موقعیت خاص بناهای تاریخی تهران و فوایدی که بر انتشار این کتاب مترتّب دانسته شد دریغمان آمد که این ترکیب را دگرگون نماییم. The truth is that historic works (religious buildings in particular) are actually lost amid the turmoil of Greater Tehran, and that Tehran today appears as a rootless city with no particular sense of identity. The first outcome of the publication of this book can be to endow Tehran with a religio-historic prestige and restore its rightfulness as a city bearing a time-honored historic past. Obviously, this book does not include all the religious buildings of Tehran, but the compilation of the most important among them within a single volume will show that Tehran boasts a varied and valuable collection of historic buildings ranging from mosques and madrasas to mausoleums, emamzadehs, and tekiehs, many of which remain unattended amid the large and small buildings of contemporary Tehran. حقیقت آن است که آثار تاریخی و بخصوص بناهای مذهبی در غوغای تهران بزرگ گم شده اند و امروز تهران شهری بی هویت و بدون ریشه جلوه می کند. اولین اثر انتشار این کتاب می تواند این باشد که حیثیتی تاریخی ـ مذهبی به تهران ببخشد و آن را در مقام واقعی خود یعنی شهری با تاریخی طولانی باز شناساند. بدیهی است که این کتاب تمامی بناهای مذهبی تهران را در بر نمی گیرد اما جمع آمدن بناهای مهم مذهبی این شهر در کنار یکدیگر نشان خواهد داد که تهران دارای مجموعه ای متنوع و با ارزش از بناهای تاریخی از مسجد و مدرسه گرفته تا مقبره و امام زاده و تکیه است که در لابلای ساختمان های ریز و درشت تهران امروز به چشم نمی آیند. The oldest buildings of Tehran are mausoleums and emamzadehs. Although the majority of them have undergone extensive works of alteration or modifications which have changed their original appearances, their ancient historic inscriptions in fact are authentic proof as to the venerable age of this city. قدیمی ترین بناهای تهران مقابر و امام زاده ها هستند. اغلب این بناها هرچند خود تاکنون تغییر و تحولات فراوانی را پذیرفته و هیئت اولیۀ خود را از دست داده اند اما دارای کتیبه های تاریخی بسیار قدیمی می باشند که در واقع نشانه های معتبر قدمت این شهر به حساب می آیند. Mosques and modrasas were mostly built after Tehran’s denomination as the capital city, and therefore, they bear more recent architectural features. This is why various forms of the mosque-madrasa combination appear and proliferate among these buildings. This scheme can be clearly identified in monuments such as the Sepahsalar Jadid (Shahid Motahhari), Sepahsalar Qadim, Mo‘ayyer al-Molk, Haj Rajab-‘Ali, Moshir as-Saltaneh (Aqsa), and Haj Ab al-Hasan Memar-bashi, etc. The influence of this scheme is also conspicuous in the design of other mosques or madrasas which have not taken the full combinational form. For example, most madrasas show to have large shabestans or gonbad-khanehs, and the mosques include several chambers for theology students. Another way in which modern architecture has affected these buildings concerns the design of their spaces, particularly, their gonbod-khanehs, as compared to those of earlier buildings. مساجد و مدارس بیشتر در دوران پایتختی تهران ساخته شده اند و به همین خاطر چهره ای متعلق به دوران متأخر معماری ما را دارند. ظهور ورواج ترکیب مسجد ـ مدرسه به شکل های گوناگون در میان این بناها به همین سبب است. این ترکیب را می توان در بناهایی مانند سپهسالار جدید (شهید مطهری)، سپهسالار قدیم، معیرالممالک، حاج رجبعلی، مشیرالسلطنه(اقصی)، حاج ابوالحسن معمارباشی و ... به وضوح شاهد بود. در طرح سایر مساجد یا مدارسی که صورت کامل مسجد ـ مدرسه را پیدا نکرده اند نیز می توان تعلق خاطر به این ترکیب جدید را مشاهده کرد به این معنا که مدارس اغلب دارای شبستانی بزرگ یا گنبدخانه هستند و مساجد صاحب چند حجرۀ مدرسه ای شده اند. از تأثیرات دیگر معماری دوران متأخر در این بناها تغییر و تحوّل در طراحی عناصر فضایی آنها بخصوص گنبدخانه ها نسبت به بناهای دوران پیشین است. 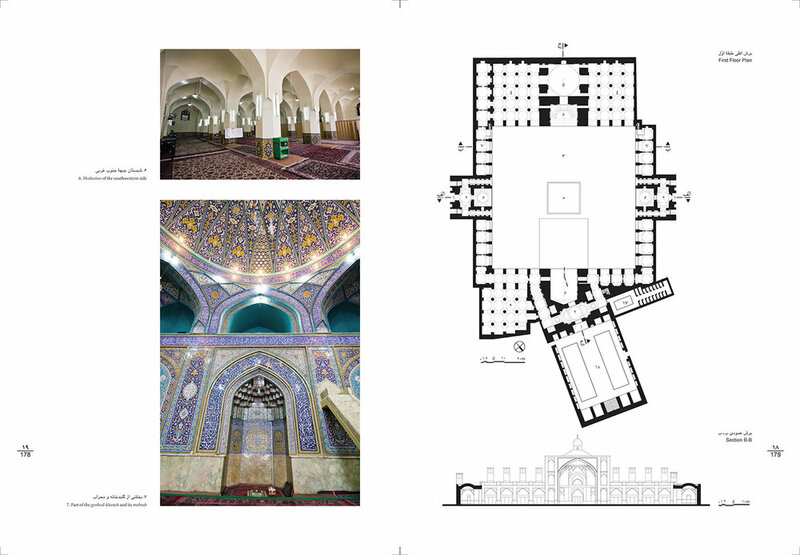 The Imam Mosque and the Shahid Motahhari Madrasa are two outstanding buildings among other buildings introduced in this book. These two large examples rank among the most important historic buildings of lran—The Imam Mosque for its attachment to the time-honored mosque design traditions in modern times, and the Shahid Motahhari Madrasa for its innovation in design and ornament within the frameworks of traditional architecture. مسجد امام و مدرسۀ شهید مطهری دو بنای شاخص در میان سایر بناهای معرفی شده در این کتاب هستند. این دو بنای عظیم هر کدام به نوبۀ خود از مهم ترین بناهای تاریخی ایران محسوب می شوند. مسجد امام به خاطر اتکاء و وفاداری به سنت های دیرین طراحی مساجد در دوران متأخر و مدرسۀ شهید مطهری به خاطر جستجوی معمارانه در جهت تغییر و تحوّل در الگوهای طراحی و تزیین ابنیه در عین احترام به سنن قدیمی، در تاریخ معماری ما جایگاه خاصی دارند. It must be added that despite the historic, artistic, and architectural values of the buildings included in this volume, they have been so heavily damaged and discordantly modified that their present conditions are no better than their ruins. 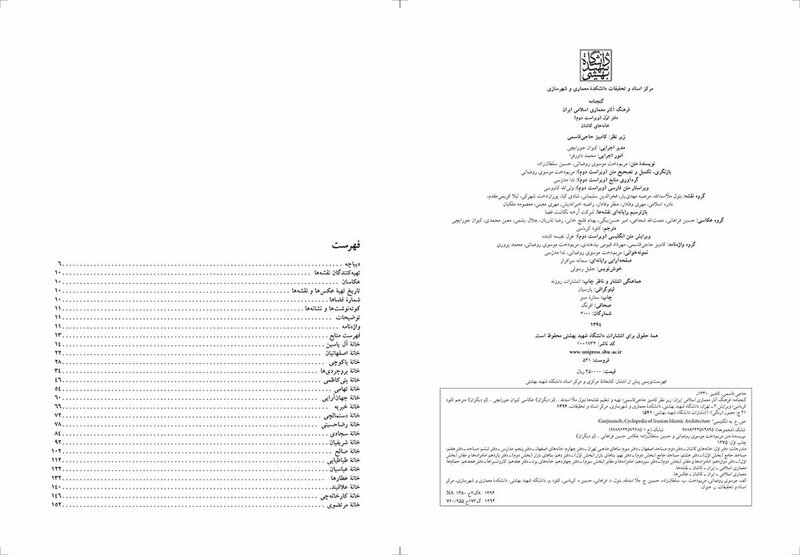 Thus, we hope that God willing, introducing the most important historic monuments of Tehran in this volume, could contribute to the conservation and preservation of these valuable works, beside stress their significance as historical documents of originality of Tehran, and safeguard them from further ruin and alteration. در انتها باید افزود که این کتاب همچنین نشان می دهد که علی رغم وجود ارزش های هنری، معماری و تاریخی در بناهای مذهبی تهران این ابنیه تا چه اندازه صدمه دیده و تغییرات ناهنجار یافته اند به طوری که در شرایط فعلی به نظر می رسد اواخر دوران زندگی خود را می گذرانند. امیدواریم که این مجلد گنجنامه با معرفی مهم ترین بناهای تاریخی ـ مذهبی تهران علاوه بر تأکید بر اهمیت وجودی این آثار به عنوان اسناد اصالت تاریخی شهر، بتواند اسباب حفظ و احیای این بناهای ارزنده را فراهم آورده و از تخریب و تغییر شکل بیشتر آنها جلوگیری نماید. The key significance of religious monuments of Tehran as the identity constituents of the city’s religio-historic background is indisputable, as it is also mentioned in the introduction of the first edition of this book in 1375. Also mentioned are the weary and deteriorating conditions of the buildings. 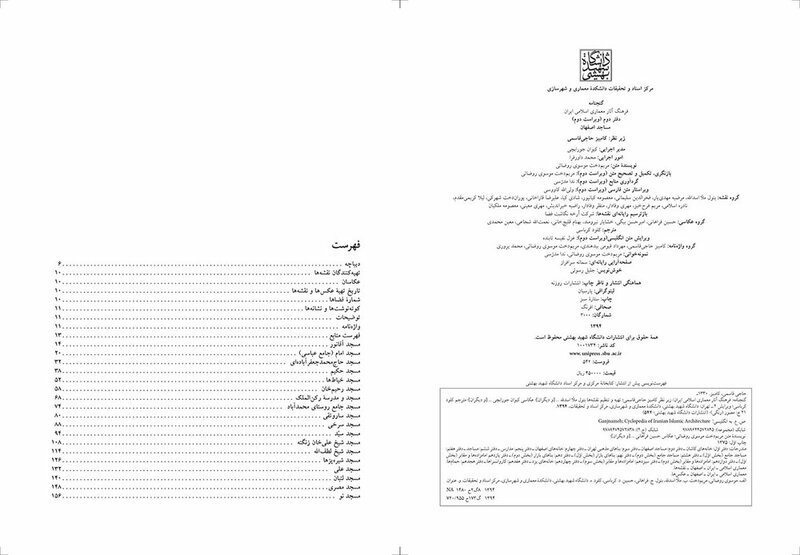 در مقدمۀ ویراست اول کتاب حاضر که در سال 1375ش نگاشته شده، از اهمیت فراوان بناهای مذهبی تهران به عنوان سند هویت و شناسنامۀ این شهر تاریخی ـ مذهبی سخن رفته است. در همانجا به شرایط نامطلوب و رو به نابودی این بناها نیز اشاره شده است. As it is evident in the photographs taken during 1390-91 for the preparation of this new edition, unfortunately, all except two of the introduced buildings which have undergone proper restoration works have fallen into a more burdensome state since 1370s. This spirit of ignorance shows on one hand, neglect of the important role of these buildings in preserving the cultural-historical landmarks of urban identity of which few only remains, and on the other, indifference towards the serene and pleasant quality of architecture and space making—the exact qualities which, ironically, we are in search for in our present urban and architectural constructions. با تأسف، تصاویر جدیدی که برای تجدید چاپ این مجلّد گنجنامه در سالهای 1390 و 1391ش از این بناها تهیه شده، آشکارا نشان میدهد که امروز، جدا از یکی دو بنایی که در این فاصله به درستی مرمت شده اند، مابقی نسبت به سالهای ابتدای دهۀ هفتاد شمسی وضعی به مراتب نامساعدتر و ناگوارتر یافته اند. وضع نابسامانی که از یک سو نشان از فراموشی اهمیت این بناها در حفظ و تثبیت آخرین نشانه های هویت تاریخی ـ فرهنگی شهر تهران دارد، و از سوی دیگر، گویای بی توجهی به ویژگیهای آرامش بخش و دلنشین فضاسازی و معماری آن هاست. شگفت آنکه، این ویژگی های زندگی بخش درست همان هاست که امروز از نبودنشان در ساخت و سازهای شهری ناخرسند و نالانیم. Despite all said, these monuments still breathe and stand, and they can be rescued from the disorganization leading to their devaluation and deterioration with a careful effort of cooperation of all authorities and individuals involved. The amiable, gracious faces of the buildings can be revitalized from under the age-old burdens and improper additions. This would undoubtedly create more pleasant spaces to live and pray, making architecture more efficient while also pushing the city to regain its religio-historic and cultural prestige and credibility. به رغم آنچه آمد، این آثار همچنان زنده و پایدارند و با اندکی توجه مسئولانۀ مسئولان و همکاری و دقت نظر دستاندرکاران میتوان از این نابسامانی که آنها را در انظار بی ارزش می کند و رو به ویرانی می برد، رهایی بخشید؛ گرد و غبار سالیان و افزوده های نامتناسب امروز را از سیمای گرفتۀ آنها زدود و چهرۀ مهربان و دلنوازشان را از نو زنده کرد. اگر چنین شود، بی تردید این آثار هم کارآیی بیشتری خواهند یافت و هم مردم در فضاهایی دلپذیرتر زندگی و عبادت خواهند کرد و هم شهر تهران حیثیت و اعتبار تاریخی و فرهنگی و مذهبی اش را بازخواهد یافت. 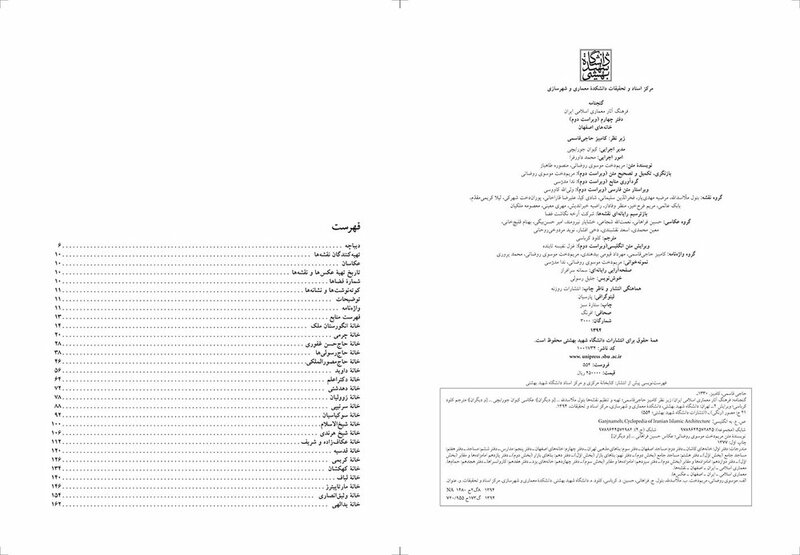 Photographing of Ganjnameh’s third volume was done digitally in 2010. Many new photos of Religious Buildings of Tehran were taken during this time by Ganjnameh’s photography team, Hossein Farahani, Mehdi Jamshidi Nasab and Khashayar Niroomand. Some of these photos were used to introduce the buildings in the book. Behnam Gelich khani, Mo‘in Mohammadi, Navid Mardoukhi Rowhani, Hamid-Reza Reza’ian Abhar, Kamran Nakha'I, Jalal Yashmi and Keyvan Joorabchi are the analogue photographers of the previous edition (1994-1996). عکاسی جلد سوم گنجنامه، در سال 1389 و به صورت عکاسی دیجیتال انجام شد. تعداد زیادی عکس جدید از بناهای مذهبی تهران طی این مدت توسط تیم عکاسی گنجنامه، شامل حسین فراهانی، مهدی جمشیدی نسب و خشایار نیرومند گرفته شد که تعدادی از آنها برای معرفی بنا در کتاب استفاده شده است. بهنام قلیچ خانی، معین محمدی، نوید مردوخی روحانی، حمیدرضا رضاییان ابهر، کامران نخعی، جلال یشمی و کیوان جورابچی عکاسان تصاویر قدیمی این مجموعه هستند که در سال های 1373 تا 1375 به صورت آنالوگ از این بناها عکاسی کرده اند. 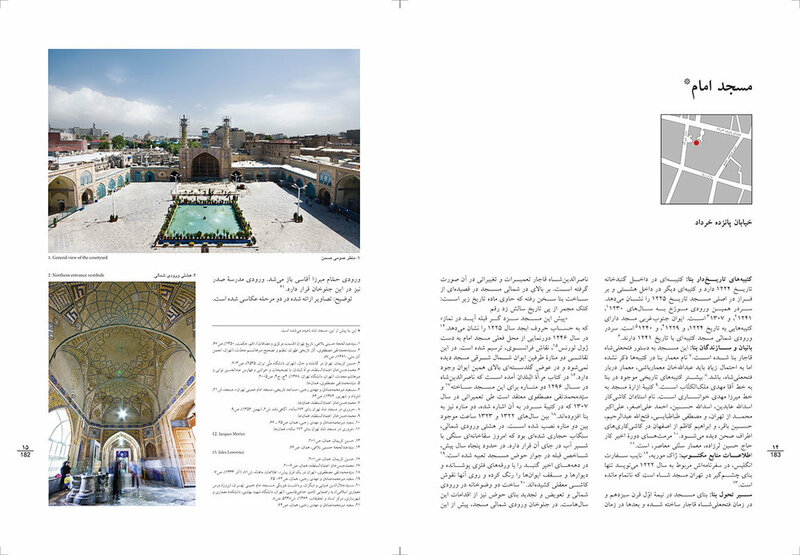 The second volume of the Ganjnameh series is dedicated to the mosques of Esfahan. Esfahan, or nesf-e jahan (literally, ‘half the world,’) is a true embodiment of ‘half’ of Iranian architecture. The multitude and diversity of architectural works still remaining in this city is stupendous, and one can only admit that from this aspect, no other city is comparable to Esfahan. دومین مجلد «گنجنامه » به مساجد اصفهان اختصاص یافته است. اصفهان به واقع نصف جهان معماری این سرزمین محسوب می شود. تعدد و تنوع آثار معماری بجامانده در این شهر چشمگیر است و باید اذعان کرد که از این جهت هیچ شهری با اصفهان قابل قیاس نیست. 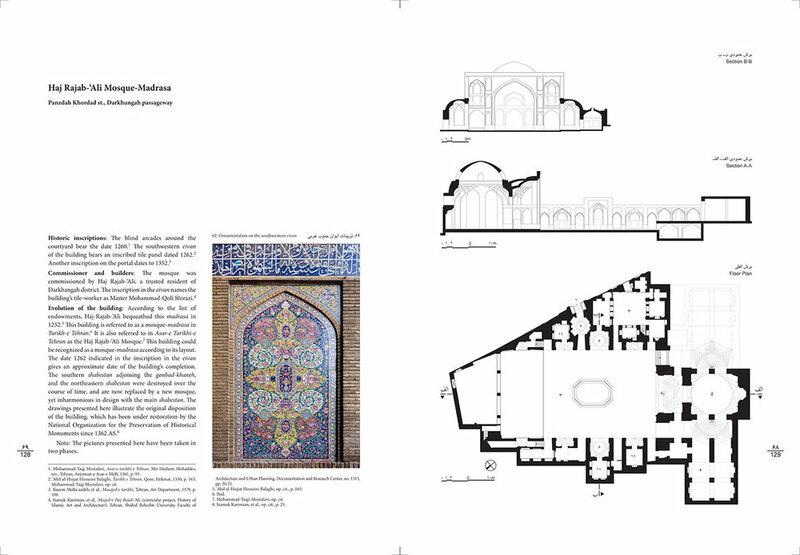 In this volume, we become acquainted with multiple examples of mosques from various periods of history which have survived in Esfahan—whether large or small, sumptuous or simple, and belonging to different eras. Admirable among them are the Imam Mosque and the Sheikh Lotfollah Mosque, which are the masterpieces of mosque architecture, and also the Seyyed and Hakim Mosques, with no less significance. There are also smaller mosques, each representing its own particular architecture, like the simple Sorkhi Mosque, the elaborate and elegant Sheikh ‘Ali Khan Zanganeh Mosque, the historic ‘Ali Mosque, the Rokn al-Molk Mosque with its altogether distinct plan, and the Aqa-Noor, Rahim Khan, and Lonban Mosques. Bringing these mosques together in a single volume bears several advantages, the most important being that, although all the buildings introduced are of the same function, architecturally they are highly diverse, and each expresses itself in a different manner. Yet, this diversity does not go as far as disintegrating their unity and severing the inherent link between them. In other words, although each one of these monuments is the outcome of the taste, creativity and innovative power of a master architect living in times and conditions of his own, they all emanate the same aura and bear traces of harmonious and unified principles. It is as though every architect who created one of these masterpieces has been but the person who, in accordance with his time’s demands and possibilities, brought about alterations and developments to his ideal mosque, while allowing for the general principles to remain unaltered for the mosque to be recognizable as such. از کنار هم نشستن این مساجد در یک کتاب نتایج مختلف حاصل می گردد، اما شاید مهمترین نتیجه آنست که اگر چه همۀ بناهای معرفی شده از یک نوع مسجد می باشند اما تنوع و گونه گونی بسیار دارند و هر یک حرف و سخنی دیگر می گویند. اما این گونه گونی و تنوع تا به آنجاییست که وحدت میان آنها را بر هم زند و پیوند درونی آنها را از هم بگسلد. به عبارت دیگر هر چند هر کدام از این بناها حاصل طبع و ثمرۀ خلاقیت ها و ابداعات استاد معماری است که در زمان و شرایط متفاوتی می زیسته است اما از همۀ آنها یک بو به مشام می رسد و در همۀ آنها می توان ردپای اصول هماهنگ و یکسانی را در طراحی مساجد جستجو کرد. گوئی همه معمارانی که در طول تاریخ این آثار را پدید آورده اند یک تن بیشتر نبوده اند و این فرد هر بار بنابر خواسته ها و امکانات زمان در طرح کلی مسجد مطلوب خود تغییر و تحولی ایجاد کرده است، تغییر و تحولی تا آن حد که طرح و الگوی کلی مذکور خدشه دار نشود و مسجد، مسجد بماند و مسجد شناخته شود. Their constituent elements are the limbs of a unique body. All the mosques have shabestans, eivans, domes, courtyards, and portals. All these elements are integrated into a particular and determined order. Nevertheless, each mosque has a different space and a novel expression. It is as though each one, in its own tongue, were singing a unique song— a song that is never to be repeated again. This harmony in diversity is conspicuous not only in the general design and spatial arrangement of the mosque, but in its constituent elements as well. 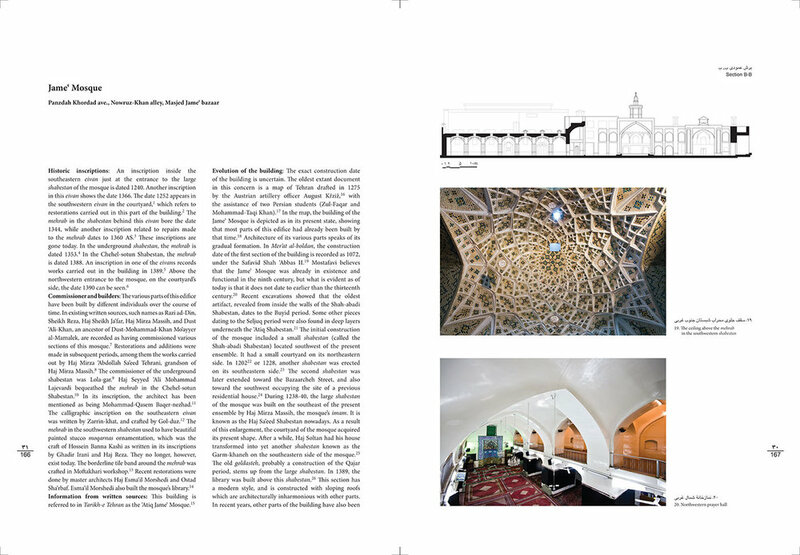 The shabestan has a clear meaning and spatial model, but it has acquired a different visage in each mosque. The same is true in the case of portals, domes and eivans. This harmony and uniformity, coupled with evolution and diversity—in the overall building as well as in its constituent elements—is the entire story of our architectural history. It is for this very reason that the presence of a lively and dynamic architecture can be seen within the framework of a prospering design tradition over a long historic period, and lessons can be learnt from it for sure. واحد هستند. همه شبستان دارند و ایوان و گنبد، صحن و سردر و همه، این عناصر را در نظمی خاص، معین و پیش اندیشیده گرد هم آورده انتظام داده اند. اما در عین حال هر یک فضای متفاوتی را عرضه می دارند و بیانی نو دارند. گوئی هر یک با زبان حال خود قصۀ واحدی را می سرایند و عجب آنکه این قصه را از هر زبانی که می شنوی نامکرر است. این هماهنگی در عین تنوع نه تنها در الگو و انتظام فضایی کلی مسجد که در عناصر سازندۀ آن نیز قابل مشاهده است. شبستان یک معنا و الگوی روشن دارد اما در هر مسجدی چهره ای دیگرگون یافته است و چنین است سردر وگنبد و ایوان. این هماهنگی و همسانی در عین تحول و تنوع در کل و جزء بنا همۀ داستان تاریخ معماری ماست و درست به همین علت است که می توان حضور معماری زنده و پویا را در قالب یک سنت قوی طراحی، در یک دورۀ تاریخی طولانی مشاهده کرد و ازآن درس گرفت. 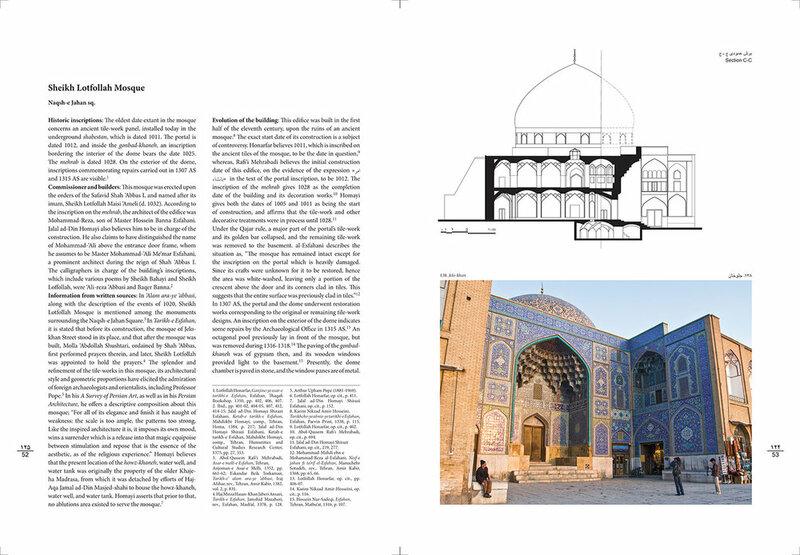 There are eighteen of the most significant mosques of Esfahan introduced in the second volume of the Ganjnameh series. However, it is obvious that this number does not count toward a complete reflection of the body of all mosques in this city. According to different sources and documents, these only sum up to one-fourth or one-third of the whole number of mosques standing yet, most of which have not, unfortunately, been thoroughly introduced elsewhere. What is more to this regret is that numerous unidentified historic monuments exist within and on the fringes of this city, falling into decay, and many others that are not even named in different books or texts. هجده مسجدی که در دفتر دوم گنجنامه معرفی شده ، هر چند از مساجد مهم اصفهان به شمار می روند، قطعاً تصویر کاملی از مساجد این شهر به دست نمی دهند. با نگاهی به منابع و مدارک گوناگون، می توان این تعداد را به سه یا چهار برابر افزایش داد. اما متأسفانه بیشتر این بناها تاکنون به شکلی کامل و جامع معرفی نشده اند. این تأسف هنگامی بیشتر می شود که بدانیم در درون و حومۀ این شهر انبوهی از بناهای تاریخی ناشناخته و رو به نابودی هست که حتی نام آنها در کتا بها و منابع مختلف نیامده است. Due to various considerations, the number of mosques introduced in this edition has not been increased. However though, many of the known historic mosques especially in the periphery of Esfahan are well worth investigating in a series such as this, among them Barsian Mosque (400s AH), Seen Mosque (500s AH), Aziran, Kaj, Dashti, and Gonbad Azadan Mosques (700s AH), ‘Ali Qoli Aqa Ensemble, Pudeh Mosque and Khuzan Jame‘ Mosque (1100s AH), and Mahalleye No Mosque (1200s AH). به علل گوناگون، در ویراست دوم مجلدات گنجنامه، بنای کار بر افزودن بر بناهای چاپ نخست نبوده است. اما باید گفت در این دفتر جای برخی مساجد شناخته شده، به خصوص مساجد تاریخی مهمی که در حومۀ اصفهان واقع اند، خالی است؛ از آن جمله، مسجد برسیان از سدۀ پنجم، مسجد سین از قرن ششم، مساجد ازیران و کاج و دشتی و گنبد آزادان از قرن هشتم، مسجد علی قلی آقا و مجموعۀ وابسته به آن، مسجد پوده و مسجد جامع خوزان از قرن دوازدهم، و مسجد محلۀ نو از سدۀ سیزدهم. 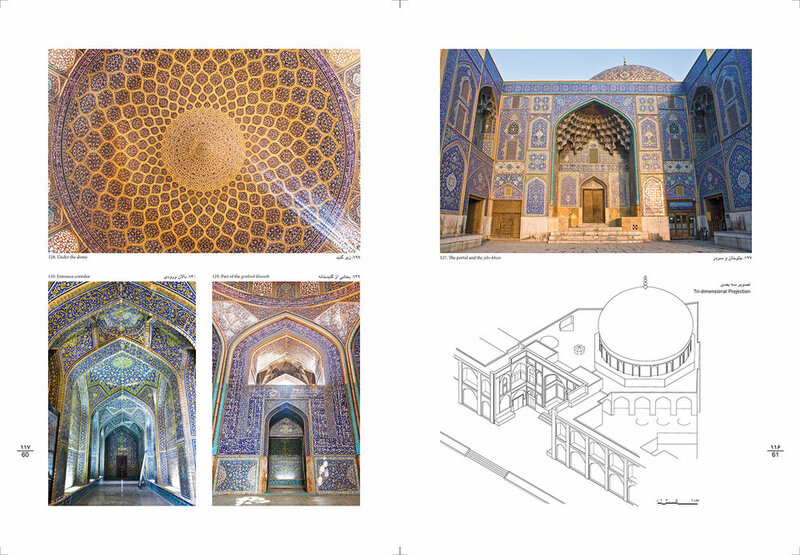 Modifications in the second edition of Ganjnameh: Esfahan Mosques include more accurate, digitized architectural drawings, new and added digital photographs of monuments, in addition to revised and improved texts to be more fully and factually representative of the monuments. 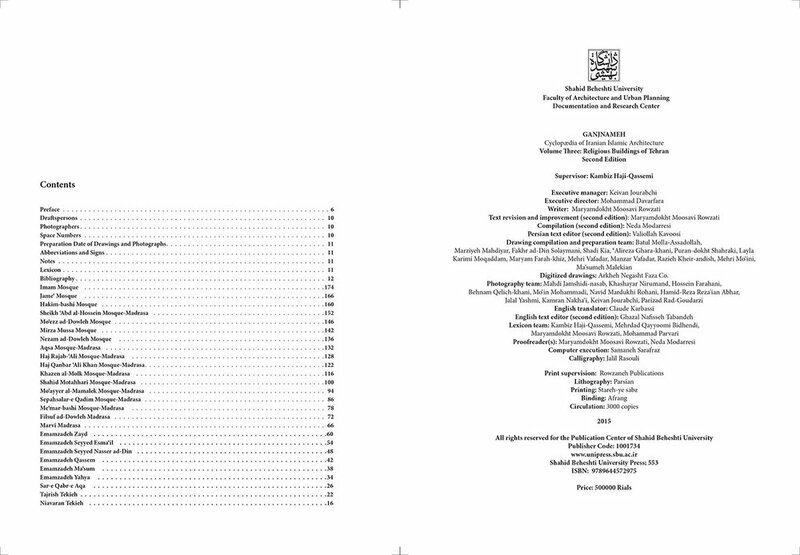 Furthermore, the new edition is prepared for researchers and enthusiasts in an optimized layout and a more elegant print. در ویراست دوم دفتر مساجد اصفهان تلاش شده است با ترسیم رایانه ای، همۀ نقشه ها کیفیتی بهتر بیابند و با عکس برداری مجدد از بناها به صورت دیجیتالی، تصاویر بیشتر و بهتری از آنها ارائه شود و با بازنگری و تکمیل متن ها، معرفی بناها کامل تر و مستندتر گردد. همچنین کوشش شده همۀ اینها با صفحه آرایی بهتر و چاپی نفیس تر به دست علاقه مندان و پژوهشگران برسد. The photography of this volume’s new edition was done by Hossein Farahani with the highest number of photos and the other members of Ganjnameh’s photography team in 2009 and 2010. The photos were taken digitally. 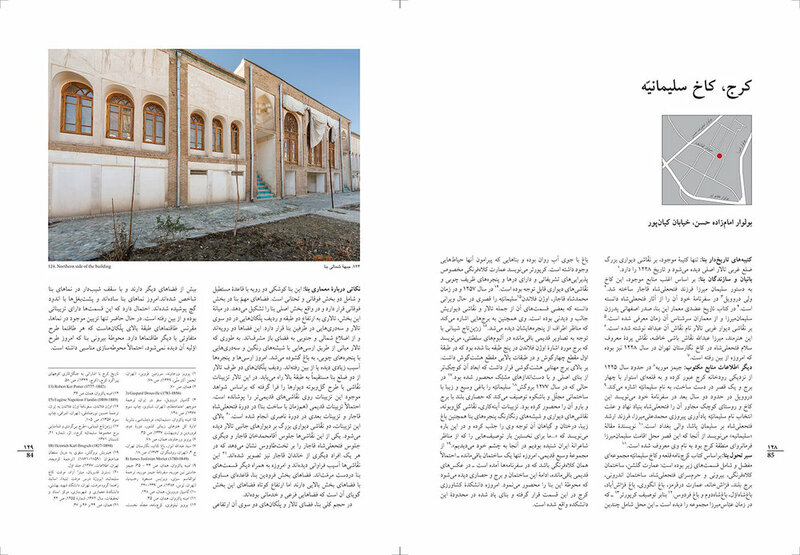 Some photos of the previous publication of the book which were slid films were reused for the recent one due to the buildings’ destruction and substandard reconstruction. Amir Hasan Beigi, Nematollah Shojaee and Khashayar Niroumand are the other members of the re-photographing team. Behnam Ghelich Khani and Moeen Mohammadi were analogue photographers of the book. عکاسی مجدد این جلد به همت حسین فراهانی با بیشترین تعداد عکس و سایر اعضای تیم عکاسی گنجنامه در سال های 1387 و 1388 و به به صورت عکاسی دیجیتال انجام شد. تعدادی از عکس های کتاب نیز به دلیل تخریب برخی از بنا ها و یا دخل و تصرف غیر اصولی در آنها از نسخه قدیمی کتاب که به صورت اسلاید هستند، انتخاب شده است. نعمت الله شجاعی و امیر حسن بیگی، خشایار نیرومند دیگر اعضای تیم عکاسی مجدد و همچنین بهنام قلیچ خانی و معین محمدی، عکاسان آنالوگ کتاب بودند که در تهیه تصاویر کتاب نقش داشته اند. 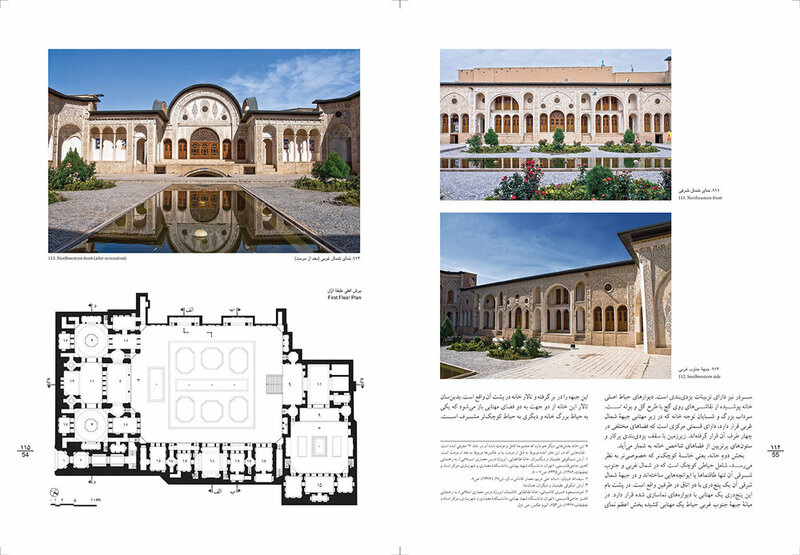 The first volume of the Ganjnameh series introduces the traditional mansions of Kashan, which can be considered a superb collection of the architecture of the Qajar period, i.e., architecture that has preserved numerous unique values of that period up to the present. It may be confidently asserted that rarely a traditional town can be found to house a comparable collection. Alongside their harmony and unity, the mansions of Kashan display also a broad variety in their design types, revealing the artistic capabilities of past architects in designing and creating space in the strictest sense. اولین مجلد «گنجنامه» به معرفی خانه‌های سنتی کاشان اختصاص یافته است. خانه‌های سنتی کاشان را باید مجموعه‌ای نفیس از معماری دوران قاجار نامید، مجموعه‌ای که در خود بسیاری از ارزش‌های بی‌بدلیل معماری آن دوران را تا امروز حفظ کرده است. با اطمینان می‌توان گفت که کمتر شهری از شهرهای تاریخی است که چنین مجموعه‌ای را دارا باشد. خانه‌های کاشان در عین هماهنگی و وحدتی که دارند، تنوع و گونه‌گونی پردامنه‌ای را در طرح یک نوع بنا پیش چشم می‌گذارند و توانایی‌های هنرمندانه معماران گذشته را در طراحی و خلق فضا به معنای دقیق خود آشکار می‌نماید. It has been seventeen years since the first edition of Mansions of Kashan got published. During this period, the Ganjnameh series has gotten better known in architectural circles, while also traditional houses of Kashan have become the focus of more attention. Some of the houses introduced in the first edition pictured in a ruined state have fortunately been restored or reconstructed in a sturdy and orderly manner as of today. Some of these houses are among featured attractions of present-day Kashan, and the destination of myriad visitors from many, sometimes very distant, locations. However though, some of the houses previously introduced have been demolished by now. But altogether, the true prominence and value of the mansions of Kashan has been restored now to a great degree in people’s views. 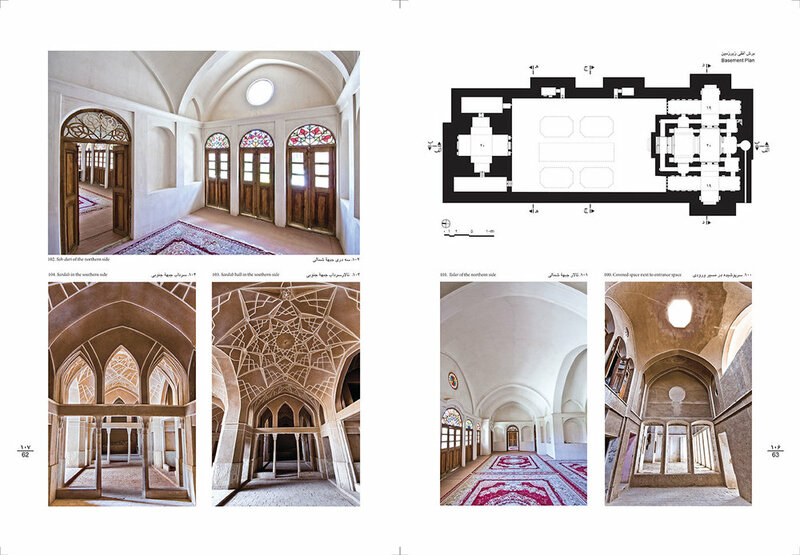 Many books and papers have been published on subjects such as the town fabric as well as mansions of Kashan, and many discussions and seminars have been held on this subject during this period, all of which indicate a more interested approach of architectural researchers toward the subject. Moreover, it has been a few years that the first volume of this series has been out of print. شانزده سال از چاپ اول جلد نخست گنجنامه که به خانه‌های کاشان اختصاص دارد می‌گذرد. در این مدت هم مجموعه گنجنامه بهتر شناخته شده و هم خانه‌های سنتی کاشان بیشتر نظرها را به سوی خود جلب کرده است. بعضی خانه‌ها که تصاویرشان را در چاپ اول به صورتی نیمه ویران یا آشفته می‌بینیم خوشبختانه امروز مرمت و بازسازی شده و صورتی استوار و منظم یافته‌اند. برخی از این خانه ها امروز از شاخصه‌های شهر کاشان محسوب می‌شوند و مردم از همه جا، گاهی از راه‌های دور، به دیدار آن‌ها می‌شتابند. البته باید یادآور شد که چند خانه نیز از آن زمان تاکنون تخریب شده‌اند. اما به هر حال می‌توان گفت که خانه‌های کاشان امروز در چشم مردم اعتبار و ارزش واقعی خود را به نسبت زیادی باز یافته‌اند. In this new edition, due to some restrictions, we have not added to the number of buildings introduced. Yet, all the text has been revised, and all the drawings have been reviewed and digitized. In addition, new higher quality photographs have replaced previous images, and also in some cases, clearer pictures have been added from the new image archive. 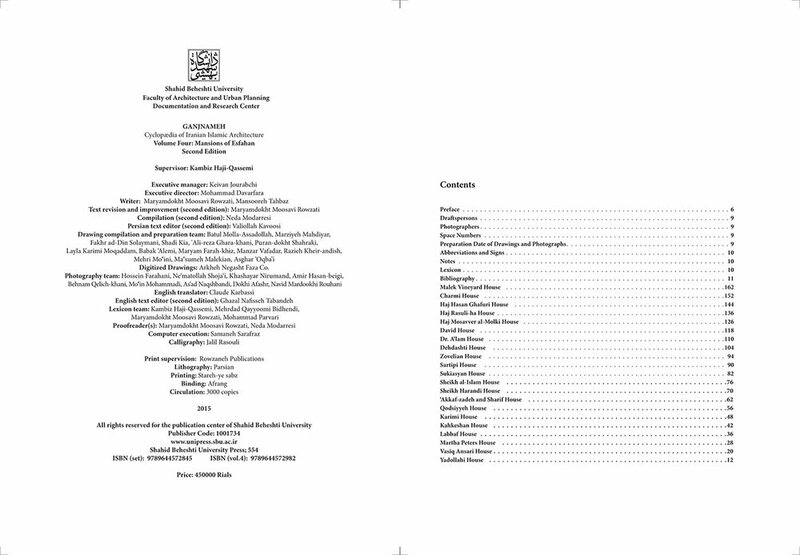 The new text has been edited and repaginated in the style of other later volumes of the series. In this way, the book is practically anewed, especially with the efforts of Ms. Maryam-dokht Moosavi Rozati and Mr. Kayvan Jourabchi, both who are longtime partners of the Ganjnameh team, as well as other partners to whom I am truly grateful. در چاپ جدید این مجلد به لحاظ برخی محدودیت‌ها تعداد بناهای معرفی شده افزایش نیافته است. اما تمامی متن‌ها بازنگری، تصحیح و تکمیل گردیده، نقشه‌ها در حد امکان تصحیح و به‌صورت دیجیتالی باز ترسیم شده است. با مراجعه مجدد به بناها، تا آنجا که امکان‌پذیر بوده تصاویر جدید با کیفیت بالاتر از آن‌ها تهیه شده و در کتاب جانشین عکس‌های نخستین گردیده است. و نیز با اتکا به مجموعه تصاویر جدید، تصاویر بیشتر و گویاتری به کتاب افزوده شده است. متن جدید مطابق سایر مجلدات گنجنامه ویراستاری شده و صفحه‌آرائی تصحیح و بازنگری گردیده است. به این ترتیب عملاً در این چاپ با کتابی نو مواجهیم که به همت برخی همکاران به‌خصوص خانم مریم‌دخت موسوی روضاتی و آقای کیوان جورابچی که هر دو از همکاران قدیمی گنجنامه هستند و سایر یاران گنجنامه تهیه شده است که جای بسی امتنان دارد. The photography of this volume’s new edition was done by Hossein Farahani with the highest number of photos and the other members of Ganjnameh’s photography team in 2008 and 2009. The photos were taken digitally. 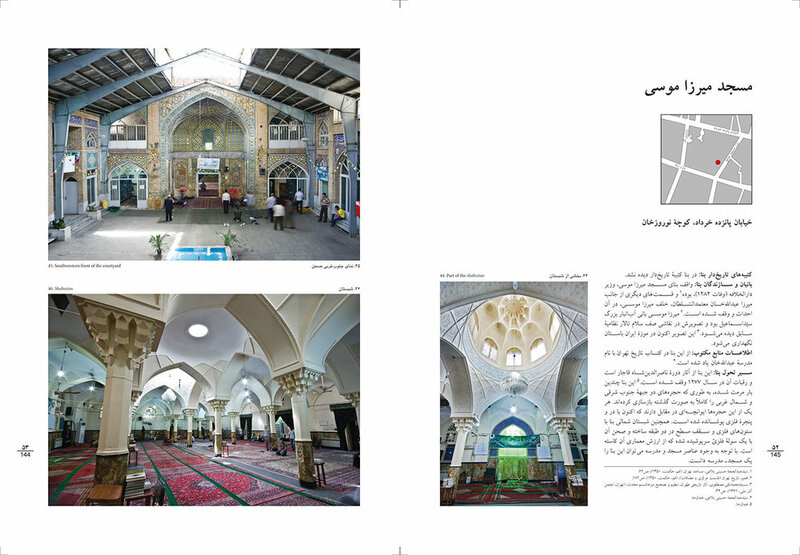 Some photos of the previous publication of the book which were slid films were reused for the recent one due to the buildings’ destruction and substandard reconstruction. Nematollah Shojaee and Amir Hasan Beigi are the other members of the re-photographing team. Behnam Ghelich Khani, Jalal Yashmi, Reza Tazrian, Moeen Mohammadi and Keyvan Joorabchi were analogue photographers of the book. عکاسی مجدد این جلد به همت حسین فراهانی با بیشترین تعداد عکس و سایر اعضای تیم عکاسی گنجنامه در سال های 1387 و 1388 و به به صورت عکاسی دیجیتال انجام شد. تعدادی از عکس های کتاب نیز به دلیل تخریب برخی از بنا ها و یا دخل و تصرف غیر اصولی در آنها از نسخه قدیمی کتاب که به صورت اسلاید هستند، انتخاب شده است. نعمت الله شجاعی و امیر حسن بیگی، دیگر اعضای تیم عکاسی مجدد و همچنین بهنام قلیچ خانی، جلال یشمی، رضا تذریان، معین محمدی و کیوان جورابچی، عکاسان آنالوگ کتاب بودند که در تهیه تصاویر کتاب نقش داشته اند. Publication of the ninth volume of “Young Cities Research Papers Series” titled “Intelligent Design Using Solar-Climatic Vision” is the result of a decade of research on understanding sun’s effect on different climates and reaching the true path and lines to make a better and more stable connection via urbanization, architecture and designing structures and efficient facades in all aspects. This book as the ninth volume of a collection of books which are the result of the research project Young Cities, a collaborative project between Germany and Iran, by representing different coherent numeral and visual diagrams fully discusses diverse locative and temporal scales all over the world such as Europe, North America (Canada and the United States of America), Australia, East Asia (such as Japan, China and India) and also the vast land of Iran with its specific climates and unique variety. انتشار نهمین جلد از «مجموعه مقالات پژوهشی شهرهای جوان» با عنوان «طراحی هوشمندانه با دیدگاه خورشیدی-اقلیمی» حاصل بیش از یک دهه پژوهش در باب درک اثر خورشید در اقلیم های گوناگون و بدست آوردن مسیر و خطوط درست جهت ایجاد رابطه بهتر و پایدار از طریق شهرسازی، معماری و طراحی سازه ها و نماهای کارا در همه جهات است. این کتاب به عنوان نهمین جلد از مجموعه کتابهای حاصل از پروژه تحقیقاتی شهرهای جوان، پروژه ای مشترک بین آلمان و ایران، با ارائه مجموعه ای منسجم از دیاگرام های گوناگون عددی و بصری به تفصیل به بحث در مقیاس های مکانی و زمانی مختلف در سراسر جهان از جمله اروپا، امریکای شمالی (کانادا و ایالات متحده)، استرالیا، آسیای شرقی (از جمله ژاپن، چین، هند) و نیز سرزمین پهناور ایران با اقلیم های ویژه و نیز با تنوع منحصر بفرد آن می پردازد. 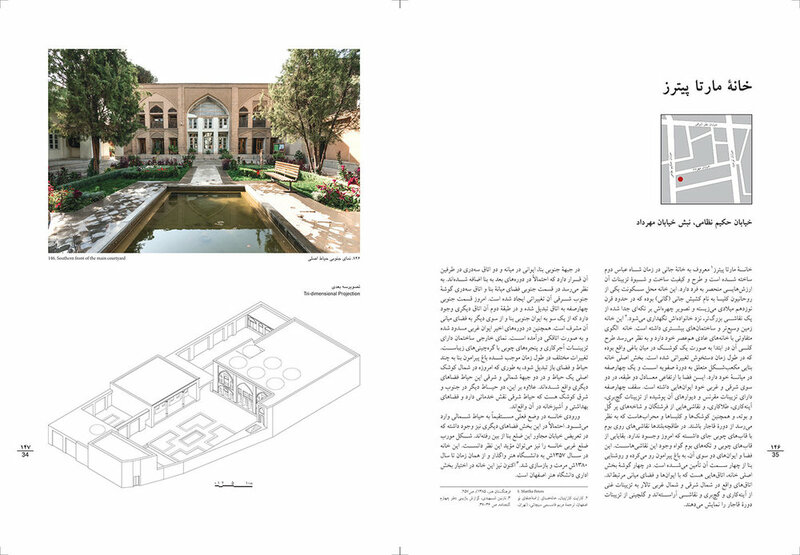 This book is a collaboration between Mojtaba Samimi, Architect of “Raz, Mehr, Mehraz” office and the programmer of “Solarchvision”, and Professor Farshad Nasrollahi, the doctor of architecture and university professor at Berlin Institute of Technology (Technische Universität Berlin) which was published in the Technology of Building and Architecture Department located at Berlin Institute of Technology (Technische Universität Berlin) in Germany. The ministry of education of Germany’s federal government provided financial support for the publication of young cities project. This book was also published with the support of Professor Rudolf Scheffer, the previous head of the architecture department at TU, manager of the aforementioned project and the manager of the Technology of Building and Architecture Department. This book which has around two hundred pages was published with Cornelia Zalmann’s support, Sharon Heidnereich’s editing, Hossein Farahani’s photographing and Boris Durenbrach and Isabella Durenbrach’s Company’s graphic by Technical University of Berlin Press and was sent to most of the university libraries in Germany and also some other famous faculties. این کتاب حاصل همکاری مشترک مجتبی صمیمی، مهندس معمار دفتر «راز، مهر، مهراز» و طراح برنامه سولارکویژن و پروفسور فرشاد نصراللهی، دکترای مهندسی معماری و استاد دانشگاه های هنر و فنی برلین است که در دفتر «تکنولوژی ساختمان و طراحی معماری» واقع در دانشگاه فنی برلین (دانشگاه تی-او) در کشور آلمان و با حمایت مالی وزارت آموزش و پژوهش دولت فدرال آلمان در پروژه شهرهای جوان به چاپ رسیده است. این کتاب همچنین با حمایت پروفسور رودولف شفر، ریاست سابق دانشکده معماری دانشگاه فنی برلین و مدیر پروژه مذکور و نیز پروفسور کلاوس اشتفان، رئیس دپارتمان تکنولوژی ساختمان و طراحی معماری، انتشار یافته است. چاپ این کتاب، که بالغ بر دویست صفحه است، همچنین با همکاری کرنلیا زالمن، و با ویرایش زبانی شارون هایدنرایش، عکاسی حسین فراهانی و گرافیک شرکت بوریس دورنبراخ و ایزابلا دورنبراخ صورت پذیرفته، توسط انتشارات دانشگاه فنی برلین منتشر شده که به غالب کتابخانه های دانشگاهی در آلمان و نیز برخی از دانشکده های مشهور ارسال گردیده است.